What if I told you that you could make ‘ticks’ which ratting super pilots could only dream of? Plus, without risking a 20 billion ISK ship or being a part of a major Nullsec alliance, sound more incising? Well it’s all possible in EVE. Welcome to the first part on what I hope will be an illuminating series on the dark arts of scamming in New Eden. We’re going to look at one of the oldest scams in the book: ISK doubling. Unless you’ve somehow managed to avoid the trade hubs of Eve, it’s likely that you’ve come across a shady figure offering to double any amount of ISK you send to him or her. Despite its antiquity, this scam works and works well, often netting ticks which would make super ratters jealous. That’s because it preys on the greed of other players: the opportunity to get something for nothing is too tempting for some to ignore. Spray and Pray – Copy and paste a cookie cutter offer to double ISK into the Local channel in your trade hub of choice, and hope free ISK trickles in. The Game Show – This is my preferred style of ISK doubling scam. The idea here is to take over Jita local with a flood of people saying you’re legit and then wait for the whales to send the big bucks. I’ve tried all of the above, and by far my best sessions have come from the game show method, so that’s what I’m going to focus on today. You might be asking yourself why you need starting ISK. You’re supposed to be making money, not losing it, right? Well yes, but in order to make the most money doubling, I’ve found, paying out the earlier, smaller ISK amounts often encourages people to a) thank you in local, legitimizing your scam; and b) play again with larger amounts of ISK. Scamming is inherently a PvP activity, but instead of pitting your fitting skills and knowledge of game mechanics against an opponent’s, the arena is your ability for psychological manipulation against their ability to resist temptation. The most successful scams are those which successfully overcome risk averseness in other players. The more people thanking you in local and vouching for your willingness to pay out, the more likely people are to drop their guard and take a chance. The purpose of the cover story is to provide a reason for other people to suspend their disbelief. Something for nothing becomes easier to believe when there’s a reason for it. You’re quitting and feel like giving away all your money. Make it feel like a milestone, and they are getting to share in it aids convincing people it’s real. You’re also going to need a cover for why you need them to send ISK first. I have my preferences, but I’m going to leave this one to you to figure out, because mine would make me too easy to identify. Other rules are up to you, just remember complexity can help sell the scam, but too complex and pilots will skip the read. 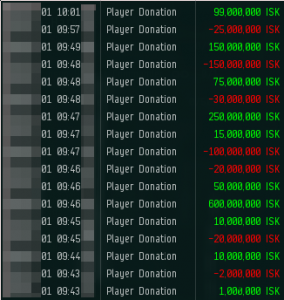 Hey Jita, I just got my first titan and I want to celebrate with everyone by giving away 10 billion ISK. Send me any amount between 5 million and 500 million and I’ll send double back. 3 plays max per person! Paid out so far: 0 ISK. Scammer: Nope, just happy to share with everyone! Give it a try, it’s only 5 mil. Alt: fine. i’ll take the hit so you don’t scam anyone else. 5 mil sent. Scammer: 10 mil sent, have fun. After this, your next alt can be the naive ‘potential victim’. Alt: hey i sent you 50 mil a few minutes ago. Scammer: <Alt name>, sorry I’m getting a lot of people wanting free ISK, 100 mil sent! You’re going to want to keep spamming your initial offering every 5 minutes or so, upping the ISK paid out every paste or two. Make sure you actually send the ISK between the characters, you will encounter a few breeds of skeptic whilst doubling, but a common type will ask for screenshots. ISK doubling between you and your alts is a really easy way to silence or befriend those players. Additionally, it ensures you have access to the wallet screenshots when required. When you start getting bites, you’re going to need to decide who’s getting paid. There’s no exact science to this, but earlier and smaller payments are good candidates for repayment. Make sure you don’t repay immediately, you want people to think you’re busy so that the people who don’t get paid won’t realize immediately that they’ve been scammed. When you pay someone, drag their name into local with how much you’ve sent them. With any luck they’ll say thanks, further legitimizing your scam. “He’ll only pay out small amounts” – make sure one of your early doubles is a few hundred mil to an alt, take a screenshot of the transaction and paste it in Local. Usually the people you’ve paid out will help with the skeptics too. Here I made about 1.1 billion in approximately one tick (20 minutes). A good Nyx pilot in Delve might hope to make a tenth of this in the same period of time. Having said that, some days you’ll lose money. Some days no one will bite. Some days the guy you scammed yesterday is going to log on right as you start and put everyone off sending you any ISK. Thank them for sending you a large amount of ISK, wait for them to confirm, then wait. If you’re lucky they’ll send you some ISK for legitimizing their scam. If you send a reasonably small amount (20 mil or less) as soon as they start, there’s a good chance you’ll get your ISK doubled. It’s a risk though. That about sums up ISK doubling, the little psychological ploy that could. Next time, we’ll be looking at another way to profit from peoples’ greed: the 3SM game, which relies on subtly modifying contracts to trick people into paying the wrong price or getting the wrong item. Have you been scammed? Pulled off any great local games? Got a specific scam you’d like to see covered? Sound off in the comments! Hiya, I’m really glad I have found this information. Nowadays bloggers publish only about gossip and web stuff and this is actually annoying. A good blog with interesting content, that is what I need. Thank you for making this web site, and I’ll be visiting again. Do you do newsletters by email? Hey there. I discovered your web site by the use of Google whilst looking for a related matter, your website got here up. It appears good. I’ve bookmarked it in my google bookmarks to come back then. Hello there. I discovered your website via Google while searching for a similar topic, your web site got here up. It looks good. I have bookmarked it in my google bookmarks to visit then. I must express thanks to this writer for bailing me out of this type of difficulty. Right after looking out through the the web and seeing methods that were not beneficial, I was thinking my entire life was done. Living minus the answers to the difficulties you have sorted out as a result of the site is a serious case, as well as ones that could have in a negative way affected my entire career if I had not discovered your blog. Your actual talents and kindness in dealing with the whole lot was priceless. I’m not sure what I would have done if I had not come upon such a stuff like this. It’s possible to at this moment look ahead to my future. Thanks a lot very much for this impressive and sensible help. I won’t be reluctant to suggest your web blog to any individual who needs and wants direction about this issue. Hiya, I am really glad I have found this information. Nowadays bloggers publish only about gossip and internet stuff and this is really annoying. A good website with exciting content, this is what I need. Thank you for making this site, and I’ll be visiting again. Do you do newsletters by email? Hi there. I found your blog via Google while searching for a comparable subject, your website got here up. It seems to be good. I have bookmarked it in my google bookmarks to visit then. Hiya, I am really glad I’ve found this info. Today bloggers publish just about gossip and web stuff and this is actually frustrating. A good web site with exciting content, that’s what I need. Thanks for making this web-site, and I will be visiting again. Do you do newsletters by email? Hi there. I found your website by way of Google at the same time as searching for a similar topic, your website got here up. It seems good. I have bookmarked it in my google bookmarks to visit then. Hi there. I found your web site via Google even as looking for a comparable topic, your website came up. It appears to be good. I’ve bookmarked it in my google bookmarks to visit then. Hiya, I am really glad I have found this info. Nowadays bloggers publish just about gossip and internet stuff and this is really irritating. A good blog with exciting content, this is what I need. Thanks for making this web site, and I’ll be visiting again. Do you do newsletters by email? Hiya, I am really glad I’ve found this info. Nowadays bloggers publish only about gossip and internet stuff and this is actually irritating. A good website with interesting content, that is what I need. Thanks for making this website, and I will be visiting again. Do you do newsletters by email? Hello there. I found your blog by way of Google whilst looking for a similar matter, your site got here up. It looks good. I’ve bookmarked it in my google bookmarks to come back then. Hey there. I discovered your blog by the use of Google at the same time as searching for a similar subject, your web site came up. It appears to be great. I have bookmarked it in my google bookmarks to come back then. Hello there. I found your site by the use of Google even as looking for a comparable subject, your website came up. It seems great. I’ve bookmarked it in my google bookmarks to come back then. Your style is very unique in comparison to other folks I have read stuff from. Many thanks for posting when you have the opportunity, Guess I will just bookmark this page. Hiya, I am really glad I have found this info. Nowadays bloggers publish just about gossip and internet stuff and this is actually irritating. A good website with interesting content, that’s what I need. Thanks for making this web-site, and I’ll be visiting again. Do you do newsletters by email? I love checking out personal blogs, Mommy blog sites, etc. What is the best way to discover these sorts of blog sites online? The most effective approach I have is simply complying with favorites individuals have – mosting likely to one blog writers “favorites” then the next bloggers faves, and so forth … I’ve attempted Google Blogsearch but all that offers me is old newspaper article, etc. Nothing individual whatsoever … Exactly how do you search for individual blog sites?. Hi there. I found your blog via Google while looking for a similar topic, your website got here up. It appears good. I have bookmarked it in my google bookmarks to come back then.